Musings about gaming, homebrew rules, and other d20 crunchies. It’s been more than a year since I started a “real” campaign, the first such attempt at such since a short-lived attempt to run through Castle Ravenloft back in… 2009? 2010? Anyway, I’ve played plenty since then, and before as well, but mostly in the “Sliders” setup, and as often a player as DM. But now I’ve passed the one-year mark (sort of), so I thought I’d do a recap of where we’ve gotten so far. We try to get together every other week, but as we are all working adults, sometimes that gets interrupted by work, kids, hospitalizations, what have you. So though we’ve been going for about a year and two months, we’ve not quite gotten to a year’s worth of sessions. Along with the having kids to deal with, our sessions usually net about 4 hours of actual play time. Between commutes, dinner, and the bedtime routine, anywhere from 1-2 hours are “wasted” on non-game stuff every night. And now that one of our company has moved out of state, there are technical connection issues to deal with as well. I was a bit surprised to count it all up and only get two “work weeks” of game time. Also over the course of the year we’ve fluctuated in the number of players available. One of our number had to drop out due to work conflicts, another stopped playing because of poor communication of the game’s goals on my part. So far no one has died (though a few have come close, almost every fight it seems someone nearly dies), but I hope think that will change eventually. Gotta make these people feel it, you know? The party started in Canterbury, Kent, England, but quickly moved to Dover, Calais, then Amsterdam after a storm hit the ship, Hamburg, then overland up through Denmark, across the water from Fredrikshavn to Gothenburg, up through Uddevalla, Fredrikstad, and finally Oslo. After about a week in Oslo they set off to Hogevarde Mountain, back to Oslo, and have now trekked up to a small settlement called Hovringen. It’s been quite a journey, and taken more than three months. The level gain is rather slow, because these folks aren’t getting into fights four nights out of seven. There’s been conflict, sure, and plenty of fights, but my XP is assigned on combat damage dealt and received, and on loot gained from fighting. So far they haven’t made the effort to get up to their waists in blood. Also, two of the current characters are multiclassed, which means they need a lot more XP to gain a level than a single classed character. It’s interesting, having played less than a year’s worth of sessions we have come so far and yet it seems like not terribly far after all. Looking at the time played, we might get just as much game time in by meeting for one Saturday a month, all day. Something I’ll bring up to the group next game. Everything is subject to entropy. Things wear out, break down, splinter, crack, chip, corrode, dull, and eventually break into so many useless lumps of raw material. Everything, that is, except the gear carried and worn by most PCs. So my party has been traveling through the Norwegian countryside, and have finally reached a stage of the journey from Canterbury, England to Oslo that requires them to camp. As such, I feel (quite naturally, I believe) that I have not challenged them quite enough to make it actually feel like they are isolated, days from help, and completely dependent on their own wit and logistical skill. Because they are. If something should go terribly wrong, likely one or more of them would die. Even if nothing untoward does happen, by the time they get back to civilization they will be filthy, dirty, smelly, tired, and ready to hole up in a swanky inn for a few days before continuing on. Or at least they should feel that way. I don’t think they will unless I do something to impress upon them that wandering the backcountry is no walk in the park. So I turned to my usual resource in situations like this, Alexis Smolensk over at his blog, the Tao of D&D. Specifically, a couple of posts titled Breaking Camp and Half Life. He tossed out an idea for the gradual breakdown of gear over time, but didn’t develop it into a full system At the time. But since I’ve been cogitating over a similar subject (primarily with how rapidly clothes deteriorate with constant wear), I figured I’d have a go at fleshing it out a bit. First, the original premise: each item has a “half life” in days, which may be shortened by extraordinary use, calculated on a sliding scale depending on the durability of the item in question. Second, a character may be more prone to breakage because a random element would be appropriate, and a wisdom check every so often seems like a good way for a character to inadvertently shorten the lifespan of his gear. Alexis also mentioned that some means of restoring lost days to gear could be included. So to start, the half life of gear is based on its material and quality of construction. Metal and stone are the most durable. So let’s throw out a number, say, 4000 days for a common metal (or mostly metal) item. That’s a ten year working life, roughly. Even without maintenance, common metal items should last the life of your adventurer. Stone, being less elastic than metal, we’ll assign a value of 2000 days. Wood, we’ll say 1000 days. Leather, 800 days. Cloth, ceramics and glass, 400 days. Paper, 100 days. A common quality suit of clothes should last about a year if well kept. The point of this half life is, as stated above, to give an indication of how many days any given item can be expected to serve reliably. Each day an item is put to use, or traveled around with, subtract one day from the half-life of the item. If an item (such as a spellbook or glass bottles or some other fragile item) is properly stored and packed for travel inside a dedicated case, I would be willing to class that item as “stored,” and not subject to degradation due to travel. Unless it’s remove from it’s strongbox and put to some use of course. The case itself, though, would still be subject to such wear. As to the quality of construction, the cost of higher quality items would indicate that an item so made is more durable and longer lasting than a run-of-the-mill item. I’ve kept Alexis’ format of pricing multipliers, while adding a “cheapening” option. The increase in durability isn’t on the same scale as the pricing, as it becomes a game of decreasing returns, as well as accounting for the fact that a lot of cost on the higher end models is accounted for by aesthetics in addition to durability. A note about the “cheap” models: instead of the standard damage die in case of accident or misuse, two dice would be thrown instead of one. I know this is “doubling up” on penalties for cheaper materials and construction, but with a base cost of half the normal item, I felt that further reducing the longevity of these items when used outside of everyday activities was justified. Now about those damage dice. Every time an item is used for a purpose for which it is not designed, the damage die indicated for the material is rolled, and the result is subtracted from the remaining life of the item. Further, I would consider combat to be an extraordinary circumstance in any case, and would apply that damage for each round of combat that a weapon or shield is involved in, and once per combat for every item carried or worn externally during a fight. Possibly more often, if circumstances warrant. 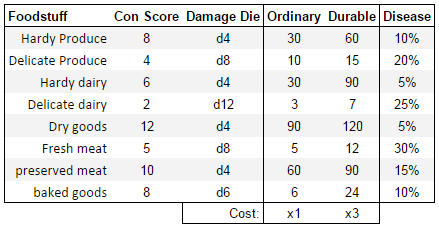 And then, if that isn’t enough, if you wish to target an individual item, each point of regular damage would translate nicely into one damage die per point of damage dealt. That would also work well for things like fireballs, dragon breath, falling into acid, etc. Also, I really like the idea of rolling a wisdom check every so often to see if inadvertent mishandling has caused the object in question to deteriorate faster than normal. Alexis suggests once a day, but I think, to lighten bookkeeping, I’d check once per week. A failed check would indicated the item took additional damage dice to it’s half-life. But what about maintenance and repair? That should be an option, right? Of course right. So, let’s say that with the expense of some time, minor materials (needle, thread, wax, oil, tools, etc.) and expertise you can restore days lost to damage or misuse to your poor items. After 20 minutes working on one item to be maintained, make an Intelligence check (or a craft check, if that’s a thing in your game). On a success, add a damage die back to the available life of the object +1. If the intelligence check fails, take that amount away. Add your craft bonus to the days added, or subtract your craft bonus from the damage dealt. Cost of materials could be 1% of original price per repair, or some sort of multi-use “kit” could be worked up. There is only so much maintenance that may be performed on an object however, so each additional 20 minutes spent in a week would impose a (cumulative) -2 penalty to each intelligence check and damage die roll. Eventually you’d just be replacing finish or stitching unnecessary holes or scrubbing an already clean pair of pants. Once the item has at long last worn through it’s useful life, and the remaining days equal 0, the item must make a Constitution check each time it is used. If it fails the check, the item is broken and unusable until it is repaired. The table indicates the effective Con score for each material type of common construction. Each step up on the construction quality gives a +1 bonus to this score. The Con scores for cheap items are at -2. Once the item is broken, repairing it will take more time and material, as well as money if you don’t have the skills yourself to effectively repair the item yourself. Exact prices negotiable, but I would lean towards 25% of the original product’s price in material, and that amount again in labor. Further, since the original item is being used as a base, that raw material is more worn than the new, so any repaired item would have a half life of half it’s original life span. What role could magic play in all of this? Well first of all, all magic items are of mastercraft quality, so they begin with the highest half life available for items of that material. Second, they will endure more abuse by only ever rolling a d4 damage die, and replace the standard Con score with the spellcasting ability score of its creator if that is higher. All of that boiling down to yes, your magic items can break, and will, eventually. Which just means you’ll have to find the magical weaponsmith (or jeweller or whomever) to get your precious things repaired. And spells? Well that all depends on the spells you have access to. There aren’t a whole lot of spells that deal with repairing items, but as a general guide I’d consider them to only work on broken-broken items, or if they restore hit points or something similar, swap in returning damage dice like attacking individual items does. So what do you think? Are your PCs going to start breaking their stuff and wearing out their boots? What’s that? They don’t want to track all of that? What if I gave you a handy-dandy spreadsheet with all of that information built in? What then? Then it’s just a one-time process to put everything in, and then add in new stuff as it comes. Easy-peasy. Here’s a link. I’m sure you are smart enough to figure out how it works. Feel free to copy and reverse-engineer. Or just paste it into your Excel- (or Google Sheets) based character sheet. The categories could use some elucidation. Hardy produce is everything like carrots, turnips, parsnips etc that can be stored in a root cellar for a while. Durable hardy produce would be apples or potatoes that can last longer. Delicate produce would be things like stonefruits, berries, leafy greens, etc. Durable delicate produce things like citrus fruits or melons. Hardy dairy would be cultured milk products, butter, thing like that. Durable hardy dairy is hard cheeses encased in wax or other impermeable rind. Delicate dairy is fresh milk or cream. Durable delicate dairy would be soft cheeses, or cottage cheese, perhaps yogurt, and eggs. Dry goods are flour, meal, cereals etc. Durable dry goods things like whole grains, rice, seeds. Fresh meat should be self explanatory, though durable fresh meat would be meat that has been lightly treated with some form of light preservation such as gravlax. Preserved meat is things like salted meats, durable preserved meats being totally dried like jerky. Baked goods would be bread, rolls, or cakes, durable baked goods being things like hardtack or crackers. Foodstuffs lose a day off of their lifespan every day, regardless of whether they are being transported or in storage. Rough handling or extreme changes in temperature (what constitutes “extreme” will vary by food type) will apply the damage die. Once the lifespan of the food item has expired, it is spoiled. If it is eaten after it has spoiled, the character doing the eating has a percent chance to get food poisoning (or other diseases if you want) equal to the number of days since it has spoiled TIMES the percent given. Thus, four days after delicate dairy has gone off, there is a 100% chance that a character consuming it will get sick. Cooking food after it has spoiled will reduce this chance to 1/10 of the disease chance, with a minimum of the base percentage. Note that 100% is not the maximum percentage for the purpose of this calculation, and the percent chance of disease will again increase by the same percentage each day. Cooking food before it has spoiled will add 1d4 days to the half-life of that item. Foods made of combined elements will have a half-life of the ingredient with the shortest remaining time after the additional time added from cooking. The Con score is included in case the food needs to make a save against some magical effect or physical destruction. So there you have it. A whole scheme for slowly breaking everything your PCs own. Now repairs and maintenance will mean something, and your players will be relieved to finally get out of that dungeon and back into town to buy a new pair of pants. So, I imagine that a lot of PCs ride around on horses at least some of the time. They are great for quicker long-distance travel, and make excellent platforms to fight from. But, when was the last time one of those fantastic horses stepped in a hole or threw a shoe? Horses shouldn’t just be a maintenance-free battle car, there is a reason that only nobles kept horses in the time period most games take place in. Horses require care, lots of it. First, the food. Horses need to eat a lot, and frankly, the grass growing around the roadside just isn’t that great of quality. Sure, it can keep the beast going through the day, but he also needs some real nutrition to maintain fighting trim. Oats are called for, or some other “supplement” feed. Every day. Grooming is also rather important to keeping horses happy and healthy. Removing parasites, detangling matted fur/manes, checking for sores under the saddle and straps, each should be done every day to prevent disease and pain in your beast of +1 fast travel. Now for the meat of the matter. Riding through difficult terrain. Taking your horse “off-road” may seem like it would be a natural thing to do, after all, horses are animals, and animals wander all over the place, right? True, animals go everywhere, but an animal is really suited to one kind of environment, and horses are great on the steppe. Or they were, when they were smaller, more agile, and used to dealing with untamed grassy flatland every single day of their lives. But nowadays, and in the days of your PCs as well, horses are bred, kept, trained, and pampered to maximize their usefulness to the human population. Warhorses are heavy and powerful to cause as much damage as possible on the battlefield, riding horses are lighter (so they eat less), but strong enough to carry a person. Draft horses are used for carrying or pulling loads along roads. And each of them are raised in paddocks and trotted out to the pasture for training and exercise. What happens when you take an animal that has known prepared surfaces all it’s life, and then make it run through wild forestland, over rocks, up mountains, across plowed fields and through deserts? It’s not going to go so well. Walking is one thing, of course, but running? That’s a thousand pounds of horsemeat hurtling along at 25 mph on spindly little legs with not much time to look where each one is being placed. There’s a pretty decent chance something bad is going to happen to a horse being put through that obstacle course. Which is where the following table comes in. 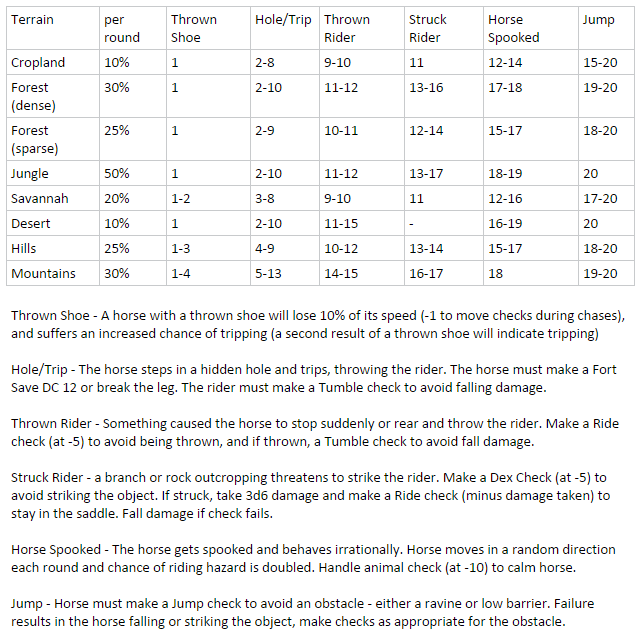 For each minute spent travel at above a trot (The four speeds of horses being “Walk” “Trot” “Canter” and “Gallop”), roll a percent chance according to the terrain type. If the chance for a mishap is rolled, then roll a d20 to see what kind of mishap occurs. Feel free to adjust DCs and checks to suit your game. Galloping through the woods is not something that is not normally done, and it should feel just as risky as it is in real life. Please note, however, that galloping on a road is a different matter, as those surfaces are “prepared” in that they are generally well suited to foot and wheeled traffic. Horses are used to roads, that’s why roads exist. If it’s raining or the roads are otherwise less suited to traffic than normal, you can roll for the cropland mishap. I use armor as damage reduction in my game. Not terribly complex, simple as using the armor class as the damage reduction value. Playing for 8 months with it now, I haven’t had any issues with it (but the highest level any character has gotten in that time is 3rd, it’s kind of slow moving). But I think I will once levels start creeping a little higher. See, I had the good fortune to be able to add another player recently,and in the process of explaining the armor thing, he asked if there were other ways to increase AC. I still use AC, it’s dex and shields which avoid hits, armor makes them less damaging. Which started me thinking, “Hmm… If AC is going to stay around 12-16 for most characters, BAB is going to become meaningless pretty quick.” So I thought some more and, as is my usual, I devised an elegant solution. Allow players to increase either BAB or a “class defense” bonus every time they would get an increase in BAB. See, the reason it’s so elegant is 1) I don’t have to rewrite the class tables, 2) it provides another way to customize for the players, and 3) it keeps the balance of to-hit and AC aligned, while maintaining the damage reduction role of the armor. I realize that keeping pace between to hit and AC will mean fewer attacks per round at higher levels, it also means there is an opportunity to unbalance characters, to focus either on hitting or attacking. Personality in combat through the rules. But I think it all works. I’ve kind of intellectually taken issue with the idea of 4 effective attacks in the space of 6 seconds anyhow, so this will also have the effect of making that more realistic, and making combat even more deadly than it has been in my game. So you’ve all seen the last (finally…) Hobbit movie, right? The one where Thorin goes half-crazy with greed looking for his gem? Good, that’s what today’s post is based on. Dragons. They’re big, and magical, and scary. They live for a looooong time, and are wicked, cunning, proud, and greedy. They probably don’t get along with each other very well for very long, and therefore, it is conceivable that they don’t reproduce like in Game of Thrones. Perhaps, they are more magical than you originally thought. Let us suppose, for the sake of argument, that dragons are more supernatural than natural. More magical than mundane. More outsider than native. Let us suppose further, that instead of hundreds of dragons roaming around the world, there is one Platonic Dragon hanging around in the aether somewhere, seeding the Material plane with magic that will turn an ordinary mortal into a vessel for the Platonic Dragon’s will. What does all that have to do with Thorin jumping off the deep end? A little something I’ve come up with called Dragon Fever. Dragon Fever is a magical disease, spread by contact with dragons or dragon’s hoards. It first drives a subject mad, and then slowly transforms the afflicted into a dragon. And, since it is primarily connected with the hoard of the dragon, it works as a sort of backup measure if some mighty hero should manage to slay a dragon. For each day spent in/around a dragon’s hoard, a character must make a will save with a DC equal to the number of hit dice the dragon who owned it possessed. Thus, a red wyrm’s hoard will have a Will save DC of 37. Failure indicates the character has been infected with the magical disease. After infection, the disease begins to progress rapidly. A Will save must be made each day against the same DC as the original save. Failure indicates the subject takes 1 Wisdom damage as the Platonic Dragon floods the victim with dragonish thoughts. This damage persists as long as the disease infects the victim. Succeeding on 4 saves in a row will mean the character has fought off the disease and will begin regaining their lost Wisdom score at the normal rate. Spells cast on the victim of Dragon Fever which directly affect the disease or the effects thereof must succeed on a Caster level check to beat the SR of the original dragon. If a character is reduced to 0 Wisdom by the disease, the character’s soul is then severed from the body and the spirit of the Platonic Dragon invades the body and begins transforming it into a true dragon. At this point the original character is considered dead, and may only be raised by a Reincarnation or True Resurrection spell. A Wish or Miracle may be used to evict the Platonic Dragon for a time, in which an ordinary Resurrection or Raise Dead spell will work to restore the deceased to life. The disease is insidious, however, as the victim will seem to recover, regaining wisdom slowly, and returning to a somewhat altered version of the original personality. What is in fact happening is the magic of the Platonic Dragon is working through the mind of the vessel as a defense mechanism and mimicking the personality of the victim. The charade will be maintained long enough for the dragon to secure isolation to complete the transformation. The vessel’s ability scores will (at the rate of one point per day) shift towards the stats for a dragon of the same size as the infected creature. Over this time, the creature’s appearance will slowly change into a more and more draconic form, which transformation will be complete when the ability scores have finished shifting. Then the dragon is wholly draconic, and not even a Wish or Miracle will banish the draconic mind from the body. I’m resuming my “serious” campaign today. I’m excited. It’s been a month now (we paused for my wife to recover from having a baby(! )), and we’ve only “skipped” two sessions (since we go every other week or so), and we played our regular (weekly) Sunday night Sliders game for two weeks now, but it still feels like forever. I’m excited. I’m excited to get back into the world. I’m excited to see what my players do in my world. We wrapped up their first dungeon in my world rather nicely just before the baby came, so there aren’t any loose end that will take getting used to hindering re-integration. A fresh start, the players with shiny new levels (in most cases), and flush with new-won gold. Ready to set off again towards their goal. I didn’t even do a whole lot to gear back up, just checked the weather and refamiliarized myself with the terrain and current events. But it’s been a while since I’ve really been inside the workings of my world, and I realized I miss it. So I’m excited to get back in. Just a taste is enough to get me hungry, apparently. Something of a Holy Grail, per se, of D&D combats in my experience is a workable, simple called shot system. I have worked up the following and think that it’s really quite simple, with a decent risk-reward balance and appropriate deference given to higher level characters. A called shot is a full round action that targets a specific part of an opponent’s body. Called shots may be declared against any non-amorphous corporeal opponent. To perform a called shot, a player first declares his intention to call the shot (called “Calling the Shot”). Then an attack roll is made against the defender’s normal AC. If successful, he then rolls the called shot percentage, which is 5% for every point of Base Attack Bonus of the attacker, minus 5% per point of AC bonus if armor is worn over the called out body part. If the attacker rolls over the Called Shot Percentage he misses, is overbalanced, and cannot attack next round. If he rolls under the percentage he may roll critical damage. 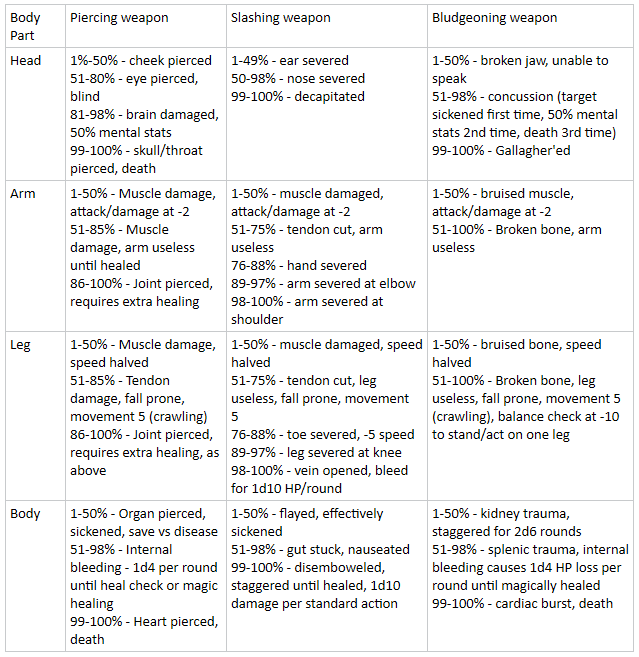 If the damage rolled (after the armor’s damage reduction is applied) is greater than or equal to 25% of the target’s total HP, refer to the following table. Other effects may occur based on local conditions. Obviously, you can make modifications as you see fit, but I will offer some modifications for various flavors. If you prefer, instead of using Base Attack Bonus to drive the CSPercentage, you can opt to use character level instead (this option might be attractive for you 5e folks). Or, to make the table more deadly, you may opt to increase (or decrease) the table percentage roll by up to the level of the character making the attack. So there you have it: called shots in a small, easy-to-swallow pill form. You’re welcome. EDIT: Changed armor reduction from material-dependent to straight up AC conversion. Let’s talk about murder for a minute. Not, like, actually killing people, but about the word. In several recent discussions online about gaming in general and D&D in specific, the word “murder” got thrown around pretty loosely. Typically in the context of characters killing enemies (and usually taking their stuff). It seems like the term “murder-hobo” is a favorite of a lot of people for the characters their players run, or imagine other players run. But I’d like to remind everyone about the importance of precision in language (especially in discussions of morality (perceived vs. absolute) and alignment. Words mean things. And even if a large portion of a population agrees that a certain word means something slightly different than the rest of the population, we would do well to return to the established meaning of the word and not be so blase about declaring certain actions to be thus or so without understanding what thus and so might imply to someone who doesn’t share the “group definition” of the word. Murder. What does this word mean? the unlawful premeditated killing of one human being by another. Ok, that’s pretty clear. At least it is to me. But it would appear that a large portion of the gaming community has a more liberal definition of murder. And I don’t mean applying the term to the killing of sentient nonhumans. No, most of the usage I have seen has had the implication that killing of any kind is murder, which when looking at the definitions above, is simply not the case. But what does it matter, you ask? Isn’t this all just semantics and kind of pointless? Maybe. But then again maybe not. When you start throwing heavily charged words around in a casual manner, you begin to have two effects on the world at large. First, you desensitize some to the usage of the word, and dilute it’s precise meaning so that the word no longer carries the meaning that it once did to an audience. Second, to others you extend the meaning of the word beyond it’s original bounds so that it includes other cases which are not actually covered by the word to be associated with the ramifications of the word. Stop all that linguistic claptrap, you! Say what you mean in plain English! Ah, yes. Very well. To murder someone (you cannot murder something), it must be an unlawful, premeditated killing. That is a very serious crime, and is only undertaken by twisted individuals, however permanent the twisting might be. To kill enemy soldiers during war is not murder. To kill a criminal who has been sentenced to die is not murder. To kill an animal is not murder. Unpleasant and undesirable, yes. Murder, no. So why do I bring this up on a blog about gaming? Because in several discussions (mostly involving alignment), any sort of killing is often deemed murder. Enemy combatants. Aggressive, dangerous monsters. Unintelligent animals. Adventurers routinely go about killing creatures such as these. But to do so is not (usually) murder. In the same way, characters who make a living by killing these threats to society are often cast in a light where they are at least as dangerous to society, and often more so than the creatures they dispatch! If you use alignment in your game, do not be caught in the trap which tells you all killing is murder, and therefore evil. It is very possible for a Good character to kill creatures, even many creatures, in a just manner. In a medieval style setting, death is a constant threat which is often faced. No one was under the illusion that pacifism was a viable option. Even if you didn’t do the killing, the armies of the king did the killing on your behalf, to keep you from being killed (or worse) by those who desire what you possess and are willing to murder you to get it. And you were darned glad of it, too! Yes, yes, I’m getting there. Be that as it may, yes, killing is obviously undesirable if it can be reasonably avoided. Having cause to take a life should be a profound source of sadness, if only at the need for it, if not also for the extinguishing of sentient life. But sadness at a necessity does not make the necessity inherently evil, or even wrong. Life is too complicated to give us the luxury of using a single word. Something that bugs me when I’m reading other DMs or GMs is when they talk about “the story you want to tell.” Now, this may just be me, but if I want to tell a story, I just sit down and write it. I don’t invite four friends over and make them jump through hoops to guess what the final resolution to my epic, earth-shattering doomsday scenario will be while carefully ensuring that they complete all the necessary steps to prevent said doomsday scenario. Thataway lies a-holerey. Now, I’m not saying that all DM-originating plots are necessarily railroading plots, nor am I saying that epic, world-threatening cataclysmic events are a terrible plot choice. What I am saying is that there is a risk for something very similar to railroading to occur when the DM has envisioned a grandiose story arc that will take the characters from 1st level to 20th and drastically alter the foundations of the society that spawned them. I am also saying that the “Ragnarok Scenario” gets kind of dull and uninteresting when you do it more than, say, once. See, the thing about a doomsday scenario is that it leads to (usually) one solution. The good guys have to win. They have to. If they don’t then the world is destroyed, which is kind of a letdown. I say usually because I suppose there are the kind of folks out there who would let the world be destroyed by whatever evil force was trying to make the planet part of a sandwich after the PCs fail to achieve some goal that would have thwarted the bad guy’s plan. Where do you go after that? Roll up a new world, I suppose. And that is when you’ve lost the suspension of disbelief. It becomes an exercise in number crunching and dice rolling, maybe with some fine script-reading along the way. But the conclusion is foregone, because the players have to win. Your story doesn’t work if the players don’t stop the threat. And that still applies if you don’t have the result of the PC’s failure being that the planet gets melted down into slag and hammered into a galactic croquet mallet. Every foregone conclusion forces the players into your plot maze, deep as it may be. And for a while, your players might love it. They just might want to replay Frodo’s quest to destroy the One Ring again and again. But you provide no better service than a video game if that is the case. D&D offers so much more. Imagine you are standing in the middle of a field. Where you were before doesn’t matter. How you got there doesn’t matter. You have the supplies in your pack, the knife in your belt, and your wits to keep you alive. There is smoke from a village on the far side of the trees on one edge of the field, a massive mountain range looms on the opposite side. You can hear the sounds of the sea and smell salt in the air, brought on a fresh breeze to one side of you, and the sound of strange birds rings in your ears from the other side. Your future is yours to make. You can do literally anything. That is what D&D can offer: Freedom. That’s what I want from a game, absolute freedom to explore, exploit, navigate, dig, buy, sell, profit, grow, lead, rule. You can offer the same to your players, if you only give them the chance. Don’t pull out another script for them to read, let them invent the plot, let them invent themselves. Let them grow into the kind of characters they desire, not the cardboard cut-outs of your plot devices. The world can be so big, why don’t you let them run around in it? If your game offers them freedom, they will return and return and return. There is no final boss battle, just the next obstacle to their personal goals; and like in real life, failure is always on the table. Since there is no script, no ultimate victory that must be won, every adventure may be the last. Tension and drama arise naturally when much is risked. Threaten the characters that have been lovingly built, and real emotions will manifest at victory or defeat. When personal goals are achieved, elation happens. When tragedy befalls them, actual despair. Not the simple feeling of self-assurance when the arch-villain is defeated in the glow of just another task completed, but true, actual, glee when the player’s personal nemesis is slain on the field of battle. You don’t need to threaten the world to get the players invested. Simply threaten all that they themselves have built. All you have to do is to let them build. Someone will always want what others have. There is always conflict, desire, power grabs, attempted coups, strife, war. Let the PC’s own actions bring opponents into the field. Victory is much sweeter when it means something you actually care about is safe. But maybe it’s just me. Here are some additional things to increase the scope of my particular non-vancian magic system. Since some people complain about the 15-minute workday that the Vancian system perpetuates, I thought I would add in some extra rules that I had thought of previously to address that particular issue. I didn’t include them originally because I didn’t want to make the whole thing too bloated. But I guess I’ll bloat it up over here and call them “optional” rules or some such so that I can claim the whole system is actually elegant and streamlined. Hmm. I should come up with a name for my system, shouldn’t I? From here on out, let’s call it Urbanekovian magic. Is that too egotistical? If Elminster, Mordenkainen, Tenser, and Otiluke get to name spells after themselves, why shouldn’t I name my system after myself? Especially since it’s fantastically brilliant. Any minor spell effect may be effected for free, as long as the base cost for the spell is lower than the caster’s level divided by 3 rounded down. Thus, a 3rd level Arcanist may cast any spell worth 1 SP (before any focus or specialization reductions) for free. Familiarity point reductions do apply. There are three options for this variant: Mild, Moderate, and Brutal. Mild version: Hit points regained by the caster also add half as many SP into the caster’s pool, up to the max number of SP the caster is allowed. Moderate version: The caster’s SP pool is not refilled by sleeping. Each hour the caster does not work any magic (cantrips included), the caster regains his Int (or Wis bonus for Elementalists) bonus in SP. Brutal Version: The caster’s SP pool is not refilled by sleeping. Each hour the caster does not work any magic (cantrips included), the caster regains his Int (or Wis bonus for Elementalists) bonus in SP. Further, if the caster is healed, he regains half as many SP to his pool as he gains in HP. Also, each time the caster takes damage, he loses half as many SP as HP. Thus, if a caster takes 12 damage, he also loses 6 SP. If he is healed 12 damage, he regains 6 SP. Personally, I like the Brutal version best, because it reflects the physical toll that manipulating the thaumflow takes on a body. Physical exhaustion makes it harder to manipulate the supernatural energies, so taking damage also affecting your casting ability makes sense. Also of note, neither of these variants has much effect on Called Ones, since their manipulation happens through an intermediary, and they technically don’t even have a SP pool. Which is another way they are differentiated from Arcanists and Elementalists.